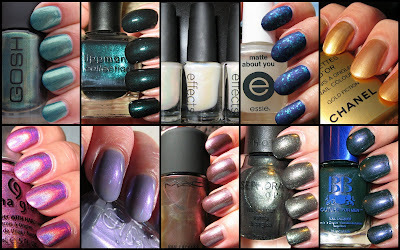 Above: A difficult decision, but these are the top ten picks of my favorite polishes acquired in 2009. In no particular order of preference, the winners are: Top L-R: GOSH Golden Dragon, Lippmann Don't Tell Mama, CND Effects (brilliant invention! ), Essie Matte About You (another brilliant idea! ), Chanel Gold Fiction. Bottom L-R: China Glaze BFF (or any of the OMG shades that I bought this year! ), Essie Huckle Buckle, MAC Toast of the Town, Sephora by OPI Absinthe Makes the Heart (also wins for Best Name of a Polish based on alcohol! ), BB Couture Pipe Bender. Below: 2009 saw some incredible collections filled with beautiful shades, unique textures and creative names. These are my personal choices for the Best All-Around Collections in 3 categories: small, medium and large. This post is long enough as it is, but had I chosen an 'extra-large-jumbo-ginormous' category, that honor would definitely have gone to China Glaze's Glitters, Shimmers & Cremes. 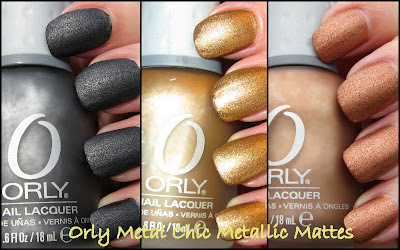 Above: My winner in the 'Small Collection' category is Orly's Metal Chic Metallic Mattes. Coming in with only 3 shades, this collection brought us one of the biggest trends of the year, the matte finish. The colors are metal shades, a favorite of mine, and the application and wear are perfect. 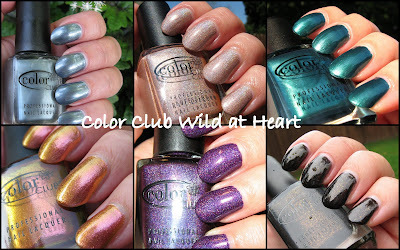 Below: The winner in the 'Medium Collection' category is Color Club's Wild at Heart. This 6 piece collection offered a variety of finishes, including 2 holographic shades and a duo chrome. The colors themselves are truly breathtaking shades. Below: My choice for the winner in the 'Large Collection' category is Barielle's All Lacquered Up. A wide range of 12 colors and finishes including an olive green, a stunning black-based teal glitter and a deep periwinkle with copper glitter helped make this an easy and obvious winner. The votes have all been tallied and the results are in. Granted, I was the only one participating in the voting, but that's all right! I thought it might be fun to go through all of my photos from this past year and choose my personal 10 favorite polishes that I've acquired during the year. While I was at it, I also chose the top 3 collections in the large, medium and small category. This has taken me several weeks to go through the photos, but I thoroughly enjoyed revisiting many of these polishes. I'm happy to say that they still bring me as much happiness as the day I got them. Ah, the many powers of a simple bottle of nail polish! I want to wish each one of you the the happiest of New Year's, and also thank you for your continued support, comments and friendship. When I started writing my blog 10 months ago, little did I know how much enjoyment I would get from it. I remember how excited I was when I had my first couple of followers, and I recall thinking how happy I would be if I could have 50 followers by the end of the year. The fact that you take a little time out of your day to spend it here with me, continues to motivate and inspire me. So cheers to you all as we ring in the New Year. You are truly the Best of the Best! Happy New Year Mary and thank you for the many fabulous swatches! I'm looking forward to 2010's swatch o rama! 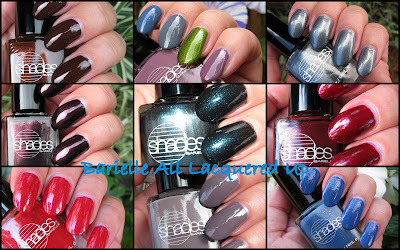 Great picks~ All the polishes are gorgeous. Great choices, love the Color Clubs! Happy New Year! Just started following recently and look forward to what 2010 will bring on your blog! This is a cool post! I think i will check some of these out soon! Happy New Year to you and your family as well, Mary! Happy, Happy New Year to you Mary! I am so glad I stumbled upon your blog. My love for nail polishes has grown so much & I have you to thank for it. I love your choices, especially the Orly collection. Are those available at any retail stores?? Thank you for existing in this world, and I will spend a little time with you on a daily basis, hopefully for several years to come. AllYouDesire~thank you :) Best wishes to you in the New Year! Evil Angel~Happy 2010 to you! Hopefully we'll have a polish-filled year! itskarmababy~thank you, glad you enjoy it! Phyrra~Happy 2010 to you also! Lisa~it was fun going through all of the photos. So many pretty polishes. Get Nailed~I still remember the day I got those! It was getting late in the day and I worked very quickly to get them all swatched before it got dark. Anonymous~hopefully, I can keep entertained and informed! Happy 2010 to you! Tuli~yes, a great year for polishes! We should be seeing plenty of pastels in early 2010. Antonea~there are a few that have been in my top favorites since I first used them. Very fun to look back at them all! Vanessa~Happy 2010 to your and your familty also! Nicole~I'm glad I have helped you :) Orly's are available at Sally Beauty, and also at various online eTailers. Have a wonderful New Year! Kim~it was a little difficult narrowing it down, but it was fun. PolishPig~I'm so happy you enjoy blogging also! I've been known to be a bad influence on some people, so I'm glad that was not the case with you~ha-ha! Continued success in the New Year. I'm just so late reading all the blogs. Those darned games on Facebook have totally sucked me in. It's my cousins fault! Anyway, I love all of your choices. We're very close in our polish likes. I especially love the Color Club collection. Such gorgeous colors. I also loved the All Lacquered Up collection. My favorite also was the periwinkle with the copper. I think I now have enough glitter polishes to cover the world. Happy New Year to you and your family. I love your blog and of course you. You really are one of the sweetest people I know.